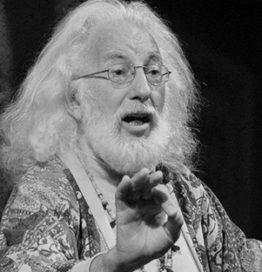 Doug von Koss is an artist, teacher and performer who presents chanting workshops, poetry performances, rituals and other festive surprises from coast to coast. Teaching by call and response, in a “perfection free zone,” Doug draws upon world music to create with chants and songs an almost instant chorus of radiant voices. His passion is to guide circles of community through ecstatic and sacred experiences of harmony and beauty that celebrate the human spirit. Doug is the artistic director of The Noah Project, a men’s ritual performance group in the San Francisco bay area. Gratitude Goulash, his joyful book of poetry is doing well on Amazon. Having retired from a life in theater and film, for the last twenty years Doug has been a senior teacher at the Redwood Men’s Center in California, The Minnesota Men’s Conference, and The Great Mother and New Father Conference.